A shot from Buffalo Sabres center Sam Reinhart (23) goes past Vancouver Canucks goaltender Thatcher Demko (35) during second period NHL action at Rogers Arena in Vancouver, Friday, Jan 18, 2019. 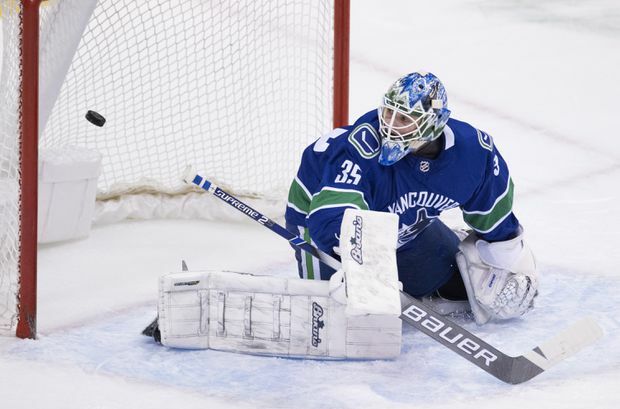 Vancouver Canucks goalie Thatcher Demko admits he was nervous before stepping on the ice on Friday night. The Canucks (22-21-6) were about to take on the Buffalo Sabres (24-18-6) and he was about to play in his second-ever NHL game. “I’ve been working hard and just patiently waiting for that first chance,” said the 23-year-old. Demko ended up stopping 36-of-39 shots, guiding the Canucks to a 4-3 win. The performance had the crowd chanting “Dem-Ko!” in appreciation for some highlight reel-worthy stops. “He was great. Good to see. He was one of our best players tonight,” Vancouver coach Travis Green said after the game. Alex Edler, Sven Baertschi, Brock Boeser and Loui Eriksson all scored for Vancouver. Bo Horvat had two assists, including one in the second period where he stripped Buffalo’s Lawrence Pilut of the puck and made a beautiful pass to Boeser in front of the Sabres net. While he doesn’t have a goal since Dec. 20, Horvat did notch his 200th NHL point on Friday. Despite the victory, the Canucks simply weren’t good with the puck on Friday, Green said. “Probably half our team didn’t play their best hockey game. And when you can not play your best and win, that’s a real bonus in the NHL,” he said. The Canucks registered just four shots in the opening frame. Demko kept the squad in a game that got off to an “ugly” start, said Horvat. But the match up wasn’t without mishaps. Late in the third period, Buffalo’s rookie defenceman Rasmus Dahlin fired a laser at the Canucks net, catching Demko in the mask. “The puck caught me just above the eyebrow and the cage was actually touching my eyebrow and my sightlines were changed a bit,” the goalie explained. He added that the timing was good because Vancouver had just killed off a penalty that saw the Sabres blanket him with shots. “So it was nice. I maybe needed a little break, too. The power play was kind of buzzing there,” Demko said with a smile. Sabres Evan Rodrigues, Kyle Okposo and Sam Reinhart all beat the Vancouver goalie on Friday. Buffalo netminder Linus Ullmark had 19 saves. Cleaning up those mistakes will be key going forward, said Buffalo coach Phil Housley. “Responsibility without the puck, that was the difference. But I can’t complain, we had a heck of a game,” he said. It’s important that the team uses the time off, Okposo said. The Canucks are currently in the post-season race, holding the second wild-card spot in the Western Conference. The team will be back in action on Sunday when they host the Detroit Red Wings.